Players in our U9-U19 competitive program are grouped into teams to participate in training and organized leagues based on their playing level. Competitive players participate in two different organizations for members to play in organized games. NorCal Premier League affiliated with U.S. Club Soccer, U.S. Soccer. When available, the program details, costs, and available payment options for the current season will be available above. Click on the tab for the age group of your child. We have a financial aid program for those that meet the qualifications. In addition to local tournaments such as our own Summer Classic (Girls & Boys), each age group at U9 and older is expected to commit to traveling to other tournaments. This may include at least one tournament that requires an overnight(s) stay. For example, in recent years some teams have gone together to the North-South Tournament at San Luis Obispo or the Las Vegas Players Showcase. Since the costs for transportation, meals, and hotels for these tournaments vary according to the situation, no specific costs have been added to the financial summary. There may be opportunities to underwrite some or all of these expenses through team coordinated fundraising activities. However, parents should make their commitment to the competitive level program based on the assumption they will have to pay for their child’s full expenses for transportation, meals, and hotels for these tournaments. It is expected that a team’s parents will help pay for the team coach’s travel expense according to the club approved budget. SRFC's competitive level teams require a number of volunteers to operate effectively and efficiently. These positions typically require a commitment for the entire seasonal year. Team Manager – Coordinates communication, player passes, team parties, parent meetings, travel, tournament applications, training schedules, etc. Individual Team Volunteers – Including snack coordinator, tournament volunteer, flag bearer, first aid, statistician, team publicity, communication coordinator (website, newspapers), etc. U9, U10 participate in the NorCal Premier League. The fall program lasts approx. 6 months, from the middle of June till the end of November. In addition, teams will play in the NorCal State Cup and other selected tournaments. The spring program last approximately 3 months from March till the end of May. Players will train and participate in the NorCal spring league, playdates, or scrimmages. Participation in the spring program is strongly encouraged but provisions will be made for players who wish to participate in other sports. 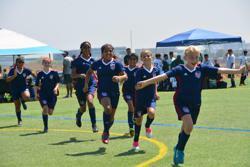 U11, U12, U13, U14 participate in the NorCal Premier League. The fall program last approximately 8 months from the middle of June till the end of February. In addition, teams will play in the NorCal State Cup and other selected tournaments. The spring program will last approximately 3 months from March till the beginning of June. Players will train and participate in the NorCal spring league, Playdates or scrimmages. Participation in the spring program is strongly encouraged but provisions will be made for players who wish to participate in other sports. 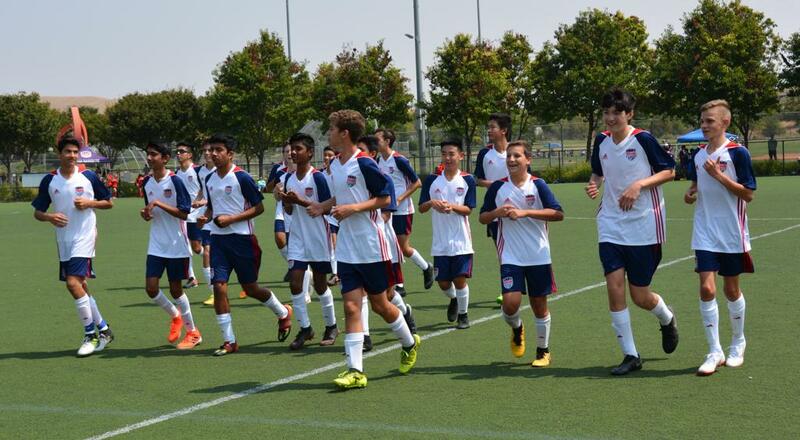 Each U15 to U19 teams will select the league (NORCAL or CCSL) that best suits its needs. The program lasts approximately 10 months from the middle of June till May with a 2.5-month break between November to January for CIF High school play. In addition, teams will play in the State Cups and other selected tournaments. Each team will have a professional staff hired to coach the team, which includes training during the week plus weekend games and tournaments. Teams train several times a week. Many teams have an indoor training session in our club's futsal facility in addition to their outdoor trainings. For each age group, the SRFC coaching staff will meet after the team formation process to firm up a list of suggested tournaments that the teams will go to based on the teams’ abilities. We will try to get many teams to go to the same tournament if possible to create the CLUB atmosphere and so SRFC has a strong presence and players can support other SRFC teams. We will also recommend/limit the number to 3 during the season plus State Cup (or Association Cup). Exceptions may be made on approval of the Tournament Committee consisting of the Technical Directors and the Senior Staff. For the older age groups (U14 and up), depending on the needs of the teams to attend College Showcases and their ability to get accepted, the head coaches of the age group together with the Tournament Committee will decide on the number and which tournaments to attend. The San Ramon FC U8 Academy program philosophy provides our young players with the best possible start to their soccer experience. As a club, we know that the age group training system will benefit your child and accelerate their development in the game of soccer. We believe that by implementing these ideas, players improve at a greater rate, all while having fun in a safe and positive environment. The SRFC U8 Academy Staff is confident that your child will thrive in a setting that encourages creativity and skill rather than in one which is focused on results and standings. If you have any questions that this page has not answered, please feel free to e-mail one of our Technical Directors. The focus of the SRFC U8 Academy program is to guide and develop young soccer players through the vitally important early years of soccer, where the learning environment and coaches can have the biggest impact, be it good or bad. The SRFC staff coaches working with these players are specifically selected because they are superb at training and understanding young children. The focus at this age is to create a fun and enjoyable environment where children can learn and play under the guidance of coaches who excel with youth development. Children at this age are like sponges, absorbing a great deal of what they see and experience first-hand. They are also capable of developing a serious love of the game at this age if exposed to the right environment. By providing a nurturing atmosphere for young players, the U8 Academy program helps create positive habits and attitudes, which in turn create the foundation for soccer excellence in future years. Creativity and enjoyment are highly encouraged through training and games, as kids who enjoy the game in these youngest ages most often thrive, and are much more likely to continue playing and enjoying the game for years to come. Our U8 Academy program focuses on developing individual players versus focusing on the results of any game or season. It is much more important to develop players within the proper framework at this age as opposed to demanding that a team win at all costs. If the goal is simply to win there are shortcuts that coaches can take at the expense of developing the player and the team. Our ultimate goal is to help each child in the program develop skills and techniques to play the beautiful game with creativity, passion and a better understanding of their role within the game. When players improve their technical ability they grow in confidence and give themselves a greater capacity to process information. This is vital in the development of young soccer players. Improving individual technique within the game is our focus. Focus on helping players develop and improve their basic psychomotor skills, coordination, balance, and agility. Our program primarily focuses on 1v1 play and creativity. However, the staff will also encourage interaction between teammates through small group activities to enhance skillful and imaginative play. For example 2v1, 2v2, 3v3 and 4v4 games and activities supplement the 1v1 skill training. The focus is for players to appropriately apply their technical skills into the game environment with teammates in small groups. It is critical that players have fun and enjoy the game. To do so, the staff creates an environment that is fun and exciting for the players as they learn new skills and make new friends. The staff believes that kids who enjoy the game of soccer tend to improve more quickly, and are much more likely to continue playing and enjoying the game for years to come. You will notice that nowhere in these goals is winning placed above player development, learning, and fun. In fact, winning as an end in itself is not written anywhere in these goals, though we do promote our players to be competitive and play to win by focusing on the developmental program goals. The entire emphasis of play in our youth development stages is on learning skills, improving decision making and learning to compete while having FUN.